A Sugar cookie is a cookie made typically from sugar, flour, butter, eggs, vanilla, and a leavening agent. Sugar cookies may be formed by hand or rolled and cut into shapes. Cream Cheese was discovered by a New York Farmer in 1872 who was trying to replicate Neufchatel. Whoever first added Cream Cheese to a Sugar Cookie dough is to be thanked. Sugar Cookies are a favorite at Christmas time at our house. The first cookie I ever made was a Sugar Cookie from Betty Crocker’s New Picture Cook Book, 1961 Edition. This cook book was handed down to me from a beloved Aunt. Even though I no longer make that recipe, I always think of her when I make Sugar Cookies. Luckily, I discovered Cream Cheese Sugar Cookies that everyone in the family loves and wants on a Christmas cookie tray. The recipe for this cookie is adapted from a 2002 Taste of Home Magazine but the same recipe is available on a lot of recipe web sites. The cream cheese adds richness to a classic sugar cookie and the cookies practically melt in your mouth. In a bowl, cream butter, cream cheese and sugar. Beat in egg yolk and extract. Combine the flour, salt and baking soda; gradually add to creamed mixture. Cover and refrigerate for 3 hours or until easy to handle. Mix Powdered sugar and water with a spoon until a thin glaze is formed and then add food coloring to the mixture. Brush on cookies with a small brush. If desired, add sprinkles immediately as the glaze will start to harden. Chocolate Crinkles are a favorite Christmas Cookie in this family. I start getting requests for these cookies right after Thanksgiving. A Teen in the family who has a birthday in December requests them for a birthday gift. They are that good. These cookies taste like a brownie, chewy, moist and fudgy. As the cookies bake they will “crack” to give them a crinkled look. This recipe is from Betty Crocker’s Cooky Book, 1963 edition. Mix oil, chocolate, and granulated sugar. Blend in one egg at a time until well mixed. Add vanilla. Measure flour by dipping method. Add baking powder and salt to the flour and add this into oil mixture. This will be a soft dough. Chill the dough several hours or overnight. Heat oven to 350°. Drop teaspoonfuls of dough into confectioners sugar. Roll generously in sugar; shape into balls. Place 2″ apart on greased baking sheet or on a baking sheet lined with parchment paper. Bake 10 to 12 minutes; or until almost no imprint remains when touched lightly in center. Cool on baking sheet for 1 to 2 minutes before removing to a wire rack. Makes approximately 6 dozen cookies. This is one of my favorite Christmas Cookies. It is an old fashioned cookie that won the Junior Division of the Pillsbury Bake-Off Contest in 1950. The recipe is taken from Betty Crocker’s Cooky Book 1976 Edition. My Cookie Cook Book was handed down to me from a favorite Aunt. I always include these cookies on Christmas cookie trays for friends and family members. I use the cut-up dates and candied cherries for the cookies that I make. You will want to double the recipe and make two separate batches at a time. One batch of cookies is just not enough. These cookies bake up soft and chewy with a little crunch from the Wheaties crumbs. Heat oven to 375°. Mix shortening, sugar, and egg. Stir in milk and vanilla. Measure flour by dipping method or by sifting. Blend the dry ingredients together and stir into the shortening mixture. Mix in dates and nuts. Drop dough by teaspoonfuls into crushed cereal. Roll gently so balls of dough are completely coated. Place cookies about 2″ apart on a baking sheet covered with parchment paper. Top each cookie with half of a cherry. Bake 10 to 12 minutes or until no imprint remains when touched lightly. Remove cookies from cookie sheet and place on a wire rack. Makes about 3 dozen cookies. This is for my Dad who was a true Southern Gentleman and Cook and who just happened to make the best Pulled Pork ever. He didn’t have one of the fancy smokers of today or even a gas or charcoal grill but some sort of a homemade smoker/grill contraption. So, Pulled Pork has long been a family favorite. In a small bowl combine all of the rub ingredients. Coat the roast evenly with the rub. 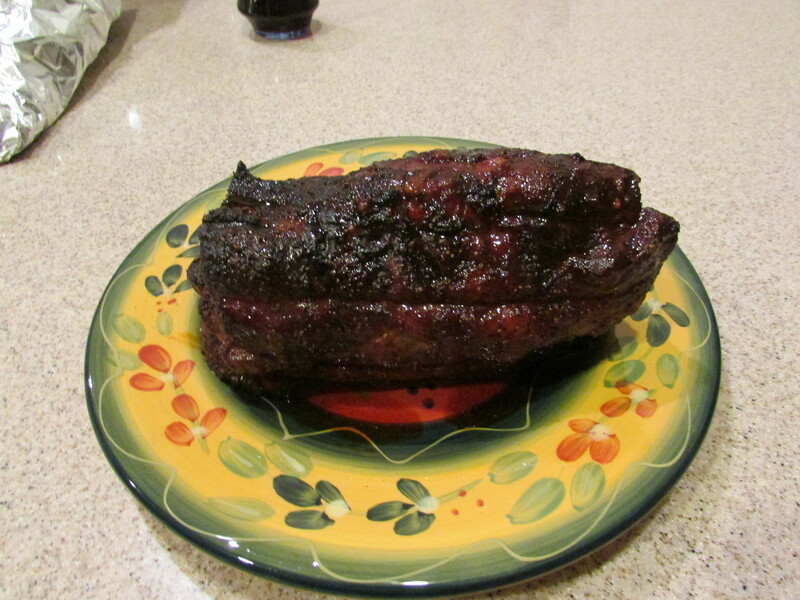 Allow the roast to stand at room temperature for 30 minutes before grilling. Prepare the grill for Indirect grilling over low heat (210°F to 240°F). Light one side of your gas grill. Place the wood chips on the lit side of the grill. Some recommend placing directly on the lava rocks or element. I simply put the pan of wood chips on the grate above the fire. Place the roast fat side up on a rack over a pan to catch the drippings. Once the grill is smoking, place the roast in its pan on the Cool side of the grill. Close the top of the grill. Try to maintain a temperature of around 225°F. Replenish the wood chips if needed. Cook the roast until an instant read thermometer registers 195°F. Depending upon how successful you are in maintaining the optimum temperature, cooking time can take from 3-5 hours. Once the roast is cooked, remove from grill and tent loosely with tin foil and allow to rest for 30 minutes to an hour. Use two forks to pull the pork. Serve on a bun with your favorite barbecue sauce. 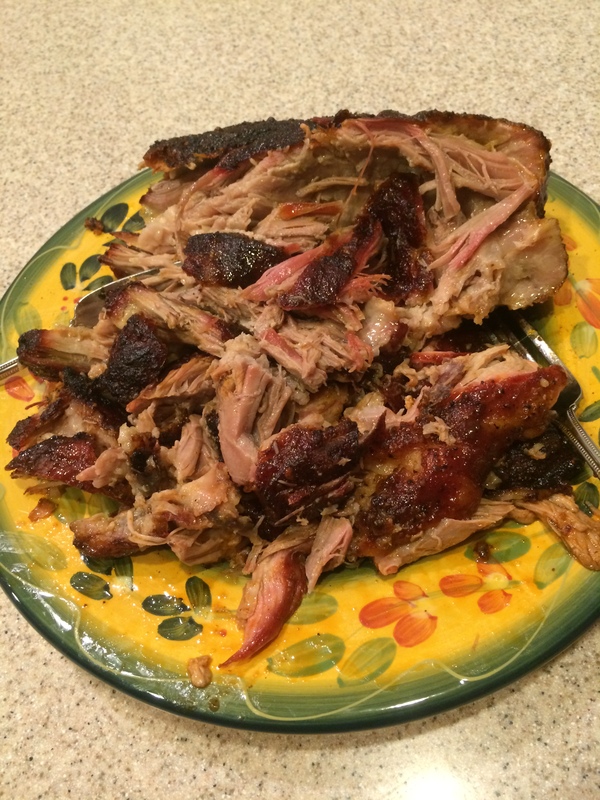 The pork goes well with a Hickory Brown Sugar barbecue sauce.